This is one of our most popular toys! These furry White mice are your cats delight! They are one of our cat toys from our NEW Classic Retro Collection. They are made out of 100% Real Rabbit fur with a leather tail and are about 2 inches long. They all have 2 leather ears and a red nose. This mouse is made with a soft plastic mold for the body with real rabbit fur around it. It has No Rattle inside, but still has some weight to it to feel real. Great exercise for your cat! They love to chase, toss and carry these guys around. The Kats’n Us Cats have field tested these toys for you. Since these toys look so real our cats play with them like they would with a real mouse. This brings out their hunting instincts. They toss them around and can even totally destroy them as if they are alive. We have not experienced them eating these and when the mice get to the point of being beyond recognition, we replace them with a new mouse. Safety first! All cats whether they are indoors, outdoors or both need exercise, human contact and stimulation. 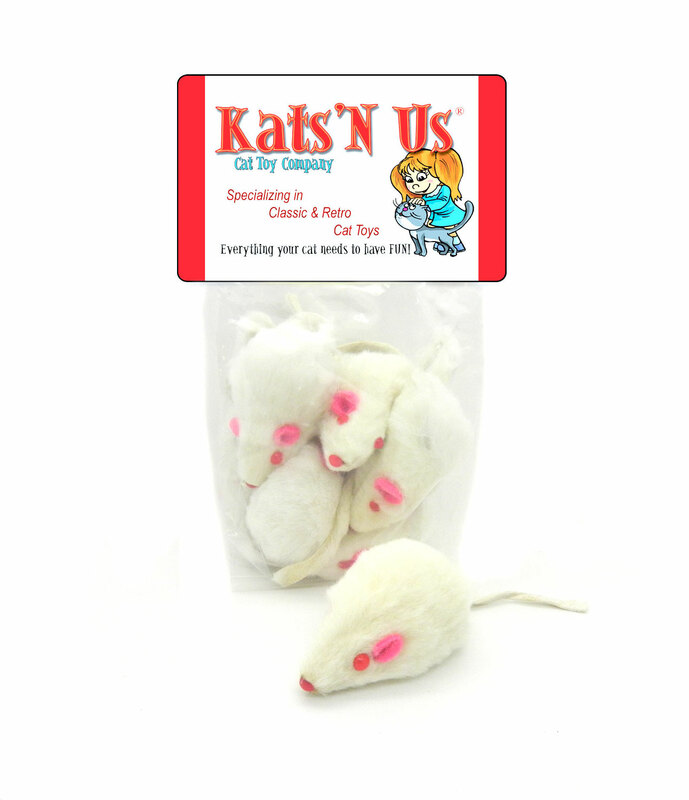 Make these mice a part of their cat toy selection. Greetings from the UK. Impossible to buy real fur mice here. my cats love these. Speedy delivery too. Cheers.